Way back when, Chinatown was the place to be. It was the only place where you could buy groceries, eat Dim Sum and wonton noodles. Oh how times have changed. Most younger folk would rather flock to Richmond instead. With that in mind, Milhouse and I decided to take a stroll down memory lane (sans the spitting) after Sunday hockey. 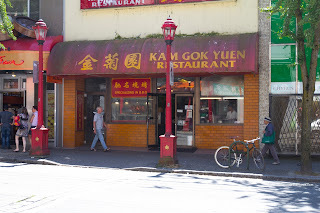 We decided to check out a classic being Kam Gok Yuen. Now this is a place we haven't been to in over 20 years! We ended up sharing 3 items beginning with the BBQ Pork and Duck Rice. It was of a decent portion with plenty of meat. We found the BBQ pork to be quite good where it exhibited that almost jerky-like exterior which was sweet and firm. It gave way to a soft, yet meaty interior. The BBQ duck was rather salty, but it had a nice texture where it was tender and a bit chewy at the same time. 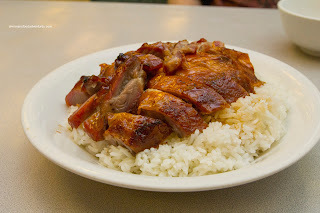 The rice was nicely sauced with the braising liquid from the duck. Next up was the Wonton Noodle. 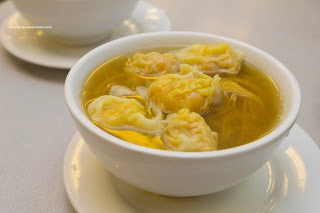 Consisting of pork and shrimp, the modestly-sized wontons were okay. The shrimp had a nice snap, yet the pork was a bit too soft for my liking. Flavourwise, it was sweet with a nice sesame oil hit. I found the noodles to be slightly past al dente where it was not chewy anymore. The soup was really mild and bordering on bland. 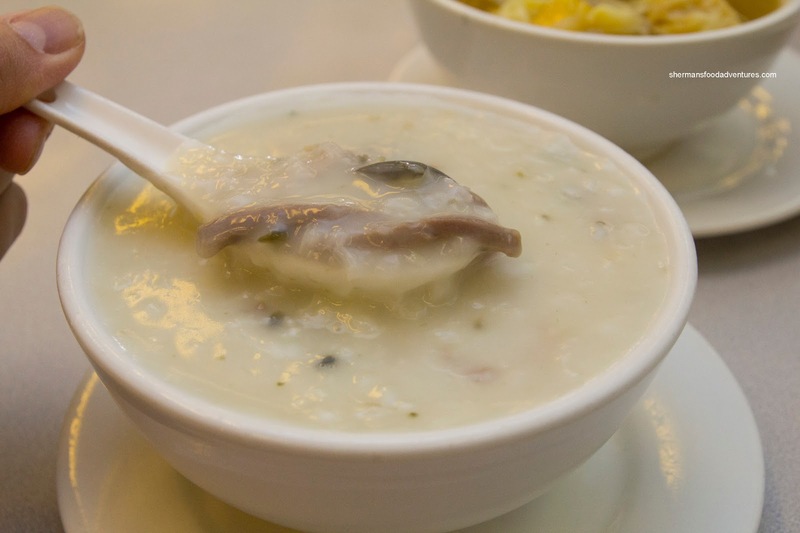 The Preserved Egg and Salted Pork Congee was pretty good despite being thickened with starch. It was silky and thick with just enough salt. There was plenty of preserved egg and nicely-sized pieces of real salted pork. So with basic sample of the food at Kam Gok Yuen, we found it to be fine considering its ol' skool roots. Nothing fancy, but it does the job. Last time I was at KGY I had a "rodentian" experience. Maybe he was trying to make a run for it (from the cooks in the kitchen) before potentially becoming menu item #44 -- Mystery Meat With Vegetables on Rice, LOL ! KGY is now, by comparison, a historic restaurant institution in Chinatown, along with Kent's Kitchen, HON's, Gain Wah and the bakeries (Boss, Maxim, Gold Stone) and Phnom Penh. Somewhat of a sad testament to the declining # of Chinese businesses and restaurants still remaining there. @LR Yup, I'm not surprised. Yah, Chinatown is and will not be the same.